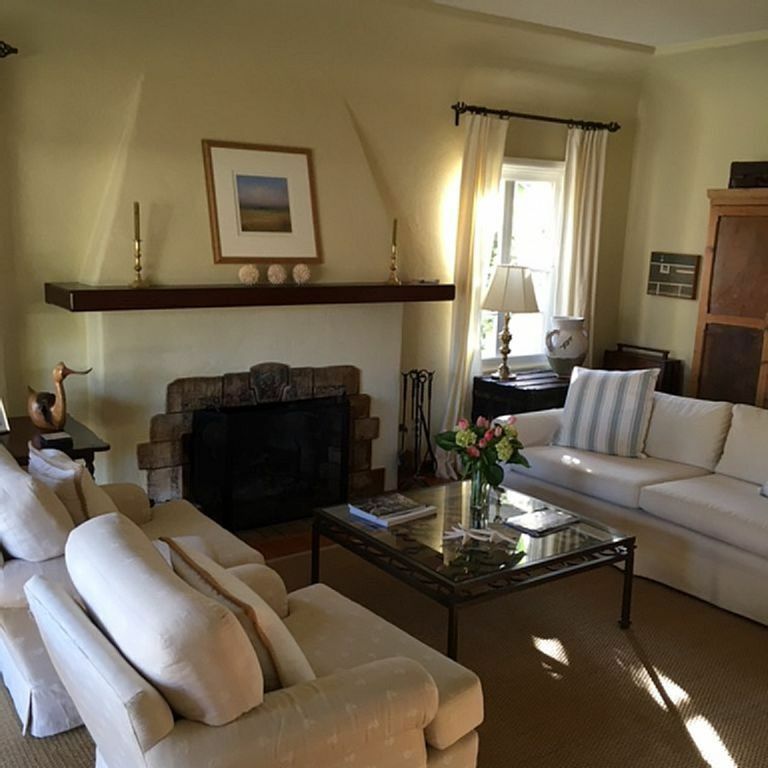 Classic California Mission style, bright, light and airy, fully furnished residence for rent. Please note there is a 26 day, town mandated, minimum rental term. Rate reduction possible for extended stay. Contact owner directly by reading info under pets. Coronado is the perfect location for those wishing to escape summer heat, winter weather or just explore the west. Located just 15 minutes from the San Diego International Airport, your family and friends will find it easy to visit. Our home is located in a quiet neighborhood, in the 700 block of J Avenue, one of Coronado’s most beautiful streets. The beach is a quick bike ride or 10 minute walk away; the village is nearby too. The house has 4 bedrooms and 4 bathrooms (3 en suite). It sleeps 7 adults in upstairs bedrooms, and two more if you choose to use the queen-size sofa bed in the family room. The downstairs study, with attached bath, acts as the 4th bedroom if needed. Situated on a large Coronado lot, front and back lawn areas provide space for outdoor dining, croquet, or bocce ball. The house is oriented so the rear yard and living space open to the prevailing daily afternoon breeze, the setting sun filtered through enormous trees in the back yard. The first floor features an open floor plan with a large living room with fireplace, dining room, family room w/ dining area, and kitchen, all open to one another. A walk-in pantry and laundry room w/washer- dryer & deep sink is just off the kitchen. There is also a separate optional bedroom ( #4 currently used as a study) with an adjoining bath (#4). The kitchen is well designed and equipped for quick and easy meal preparation or for a gourmet cook. Indoor- outdoor entertaining is easy with direct access from the kitchen and family room to the outside deck and yard. A 3 burner gas grill (piped natural gas, no bottles to fill) sits just off the deck. The lawn and garden will be maintained weekly at not cost. Housekeeping available. Terms to be discussed. Renter pays final move-out cleaning fee. Master bath with dual vanity, walk in shower, all in marble. French doors open to the west for daily breeze. BATH #2-- full tub/shower, single sink, toilet. Across the hall from Bedroom #2. BEDROOM #3-blue room in the pictures. Walk in closet-double rods and shelving. Sitting room off the bedroom can be used as an office or sleeping area for a twin bed or crib. BATH #3 --stall shower, single sink, toilet. Bath attached to bedroom. BEDROOM #4- First Floor, currently shown in the photos as a study, can accommodate additional sleeping arrangement. Wet bar with marble top. BATH #4 – stall shower, pedestal sink, toilet. Bath attached to bedroom. Possible two Master Suites-- the house has what could be considered two master suites. The MASTER SUITE noted above (designed as a true master suite), and BEDROOM #3 with walk in closet, adjoining sitting room, and bath. With two master suites, two families could easily share the house. The house has hardwood floors except for the master bedroom, (carpet) and study (tile). Fresh upholstery and slip covers are underway. Assorted beach cruiser bikes and beach chairs provided. Numerous ice chests of varying sizes. Boogie board, water ski, wake-board, and two person tube--- boat rental available on Glorietta Bay. If you have a yacht club membership, you might investigate potential reciprocal arrangements at our local club. Pets—we've always had Labrador Retrievers, so the house and yard can work well for a dog. Our dogs however have never been allowed upstairs nor on furniture and we would extend the same requirement for any approved dog. If you want to talk about having your pet at the house, we would need to meet the pet long before any deal is struck. Please call John Turpit to discuss the pet option or to learn more about the property-619-987-7453. Or just consider the house not for pets. We’ve rented numerous houses ourselves and have high expectations for ourselves and tenants. Our house is ideal for a family, or two families, but not meant for events such as weddings or student gatherings. Our neighbors, as do we, expect things to quiet down by 10PM. If you do plan a late night gathering with drink and music, be sure to alert the neighbors, or better yet invite them to the party. They are great people. This is our family home. We raised our children here and have lived in the house year round, keeping it updated and well maintained. Coronado is a great community for families. Though nearby, our property is removed from the daily noise and activity at the beach and village. It is also popular with young and older couples because of it's walk-ability, great village with shopping and restaurants. And then there's the beach. It's one of America's 10 BEST BEACHES, year after year. QUIET STREET CLOSE TO THE BEACH CLOSE TO THE VILLAGE CLOSE TO SCHOOLS WALKABLE BIKABLE GREAT 4TH OF JULY PARADE AND CHRISTMAS CELEBRATIONS. toilet, shower, bath #3 is en suite with bedroom #3.
toilet, shower, off bedroom/study #4, first floor. 12 cup , plus single cup Keurig. CORONADO HAS A BOAT HOUSE ON GLORIETTA BAY. RENT EVERYTHING. BOAT RENTAL ON GLORIETTA BAY. GARDENER COMES ONE A WEEK TO CUT THE LAWN. COST INCLUDED. Monthly summer rate is $12,500 per month, except July which is $15,500. Two or more contiguous, full months of rental can reduce July rent. School year rate is $8500 per month.